A relatively quiet weather pattern shaping up for the next week or so. BALTIMORE — Friday evening (March 16, 2019) provided us with a little snap, crackle, and pop from the atmosphere above as a line of scattered showers and storms rolled through. Most of the activity was below severe limits but did pack a punch as gusts approached 50 mph in some neighborhoods around the area. The drying trend has now taken over with sunny and breezy conditions to kick off St. Patrick's Day weekend. Although the chill has returned and the breezes remain Saturday marks our 5th dry day this week. Just think last weekend at this time along with many weekends since the start of 2019 we have been talking about some sort of precipitation falling (i.e rain/snow). 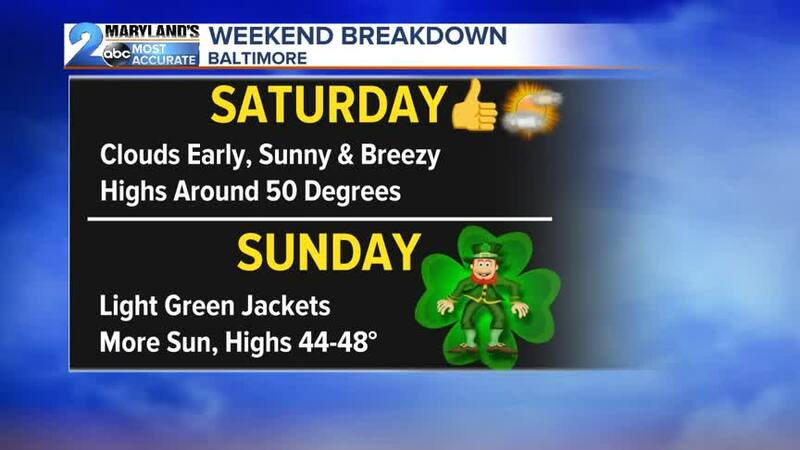 This weekend will be our second dry weekend in more than a month. The last one came February 2nd-3rd, 2019. Hey maybe we have the "Luck of the Irish" with the Leprechauns looking down upon Baltimore guarding our beautiful Guinness Brewery over in Halethorpe, MD. All in all though have we finally found the "Pot Of Gold" to end this prolonged wet stretch that dates back to July 2018. Long range 8-14 day trends show above normal temperatures and below average precipitation. For the 7 day forecast though we are looking at two vigorous storm systems which could put a wrench in our dry weather. Models paint a little snow for early Monday morning before another weak ripple of energy drops a few showers into the mix late Thursday into Friday morning. These precipitation chances are relatively low though based on the amount of dry air that looks to be in place. For right now though the dry stretch will last the weekend. If we can string together though Monday through Wednesday that will put us at 5 dry days in a row which has not been since December 8-13th, 2018. Let's cross our fingers that the dry air will win out over the next few days ahead. Even with precip chances Monday morning then again late Thursday into Friday we are not looking at anything substantial as long range amounts stay below 0.10". With that said if the dry air wins we may get a completely dry week from Sunday to Sunday. This has not happened in Baltimore since July 8-14th of 2018. From that time until now we have received over 56" of rain so a dry spell is needed since we just came off the wettest year on record and now begin 2019 on the same note. Sometimes not having rain is a good thing especially with Spring arriving at 5:58pm Wednesday. We have plenty more wet months to go.